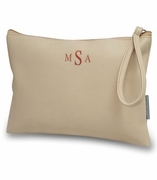 Monogram jute make up bag. 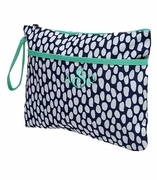 Our cosmetic bag features the classic color block pattern with a cute tiered tassel threaded through the zipper pull. Stunning color combination with your choice of fuchsia, orange or taupe thread for your personal initial or monogram for a bold contrasting look. The bag is made from jute, making it eco-friendly and adding a feel-good ambiance. Use it for your cosmetics when you travel, the interior has a laminated lining for ease in cleaning and spills. Matching tote bag available search item MP-8613351NY. 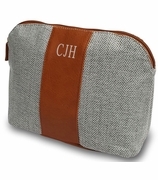 Monogram color block jute cosmetic bag measures 12"W x 8"H x 3" across the bottom.